SOTC Travel Limited. 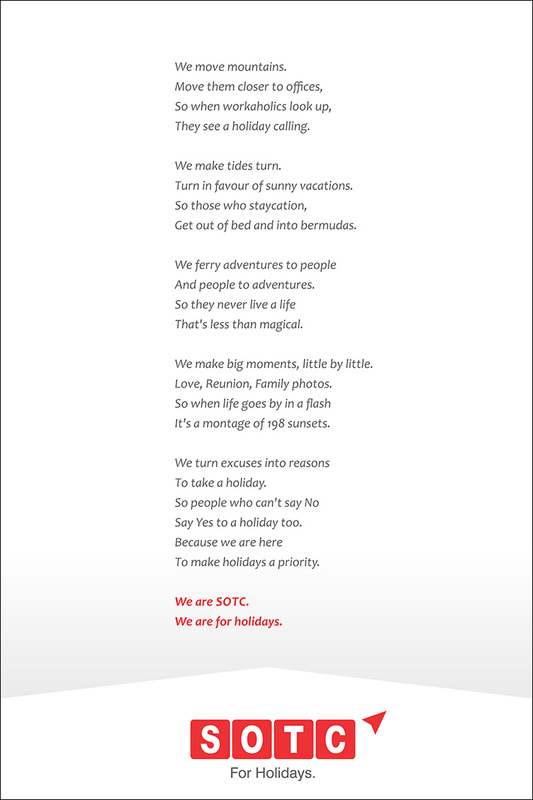 (Formerly SOTC Travel Pvt. Ltd.) is a step-down subsidiary of Fairfax Financial Holdings Group; held through two companies, its Indian listed subsidiary, Thomas Cook (India) Limited (TCIL) and TCIL’s subsidiary Travel Corporation (India) Ltd.
SOTC India is a leading travel and tourism company active across various travel segments including Leisure Travel, Business Travel and Distribution Visa Marketing Services. 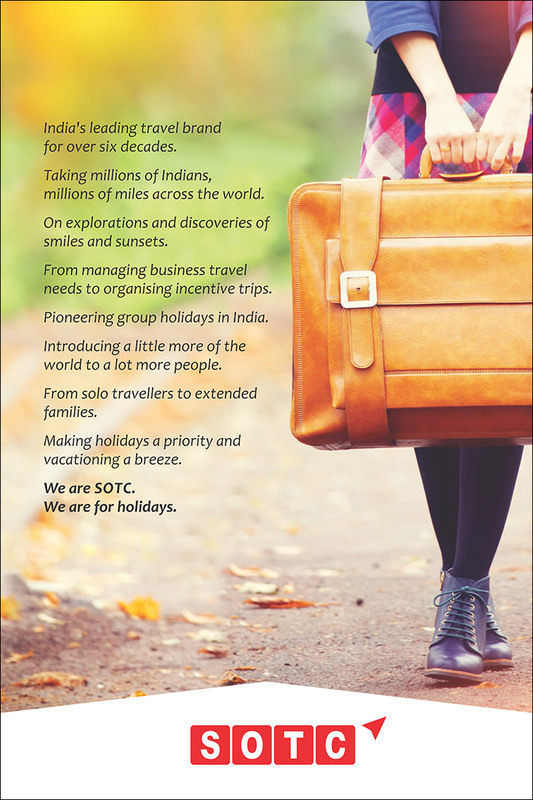 With a dedicated team of over 100 professionals across India who specialize only in meetings, incentives, conferences and events, SOTC’s customer focused strategies and national reach have consistently ensured our market leadership in the MICE segment of the outbound travel arena. Business Travel India, is amongst the leading travel management companies providing customised travel and travel-related solutions for India’s top corporates. With leading edge technology, user-oriented software applications and strong focus on service and customer needs, Business Travel has firmly established itself as the expert in the corporate travel segment. Many of India’s top companies have chosen us for our global capabilities and specialized local expertise. Having the best people with the right skills and knowledge is the key to Business Travel‘s success. Time-strapped corporate customers get all their travel needs met at a single window. To assist them further, implants are placed within their offices to provide personalized service with backup facilities from the various branches. At present, Business Travel caters to 400 Indian & multinational corporates providing round the clock travel solutions. Distribution. Visa. Marketing. Services. – DVMS is a trademark brand owned by SOTC having its own 8 Visa Application Centers (VAC), 16 priority partners locations and 3000+ travel agents under its fold within India offering Visa and Meet & Greet Services for customers travelling to UAE and Bahrain. In addition, the international presence across Russia, China, Sri Lanka and Philippines has enabled DVMS to cater to its global customer needs for processing UAE (Dubai, Abu Dhabi, Sharjah etc.) and Bahrain visas.